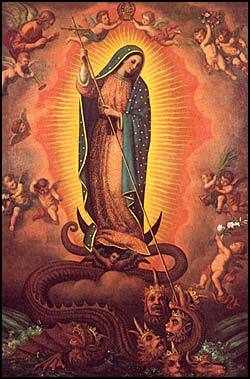 The Woman clothed with the sun, in the image is of Our Lady of Guadalupe, Protectress of the Unborn. 1. What is Spiritual Adoption? Spiritual adoption consists in personal daily prayer over nine months for a child in danger of being killed by abortion. This commitment is made by a public promise to God, in the presence of a priest and congregation. Each person making the commitment makes it for the protection and defense of one child whose identity is known to God. Spiritual adoption is a form of expiation for the sins of infanticide, especially those committed by physicians, midwives, and nurses. 2. Who may make this commitment? Every person who has reached the age of reason, including children, once they received their first communion. For nine months every day to do the following things: to pray one decade of the Rosary; to recite the prayer for the unborn child; to perform an act of penance or pray an additional prayer. O Most Holy Virgin Mother of God, Mary, all the Angels and Saints, inspired by the desire to defend unborn children, I firmly resolve to adopt spiritually a child whose name is known to God alone, and I promise from [MENTION DATE] for nine months to pray each day for that child's life may be spared while in the womb, and that she or he may live a just and righteous life after birth. I will fulfill this promise by the following acts: praying one decade of the Holy Rosary; performing an act of penance or praying an additional prayer; by reciting the prayer for an unborn child which I shall say for the first time today.